The Pro-Keratin Fiber enriched formula is designed to deliver immediate results, distributing volume and visible intensity to your lashes. The spoon-shaped brush helps fan lashes out. To me waterproof mascara is a staple for me. 5 days a week I wear it and cannot live without it. 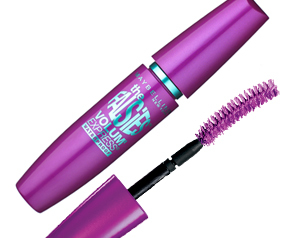 So last year when everyone went nuts for Maybelline's Falsies mascara I said I would wait until there was a waterproof version of it. Now there is one so I decided to try it out. First of all, I like the brush, it works great. It fills in gaps nicely and works through the lashes well. Secondly, the formula is a nice constancy and not too thick or too liquidly. It gives a nice fullness to the lashes as well as length. Now on to the waterproofness. To me waterproof has to mean WATERproof...most just don't cut it. This formula is good but not excellent. It is slightly sticky and can stick together as the day goes on. No flaking, which is great (most flake on me). My biggest gripe is with the sticklyness. If I touch my lashes right now m lashes will clump together and stay that way. Hair will stick to it (yep, I work as a groomer so today while I wore it to work we groomed 5 Himalayan cats, that is a lot of hair to get stuck in your lashes and a lot of annoyed Jill). If you just want a mascara that is better than non waterproof mascara this might be good for you. It doesn't flake but it is sticky which can be problematic. I am sure if I rubbed my eye right now it might smudge a bit (because of the sticky factor). I would use this on lighter work days, or days I might want something a bit better than a non-waterproof mascara. Next time I might just buy the regular version, but keep in mind my waterproof needs are very different than most peoples.